View More In Networking Products. How to the easy setting up HEXICOM AV200M powerline adapter? WAN port and router"s LAN port. If you plug in the slave adapter separately. Wired and wireless cannot enter the setting interface. →Easy Installation：Powerline adapter units can make you create a network using the existing electrical wiring within your home/office. Your data will transmit from one powerline adapter to another. No ethernet cable is required. Connect your PC or cell phone to the Powerline adapter by ethernet cable or WiFi then you can use the high-speed reliable network. Plug And Play! →Powerline network adapter (Master and Slave) both have built-in wifi（2.4G）function,Use them to provide wired and wireless coverage to hard-to-reach locations.It use the same wireless settings, and the device switches seamlessly between the WiFi of the master and extender. →You can configure your device with wifi timer、wifi-on/off、wifi-concealment、wifi output power adjust, black/white list etc.Exclusive plc signal analysis function, help you find the best plug which can give you a more stable and fast PLC network connection;Plug powerline adapters to a wall outlet getting more stable and faster network signals. 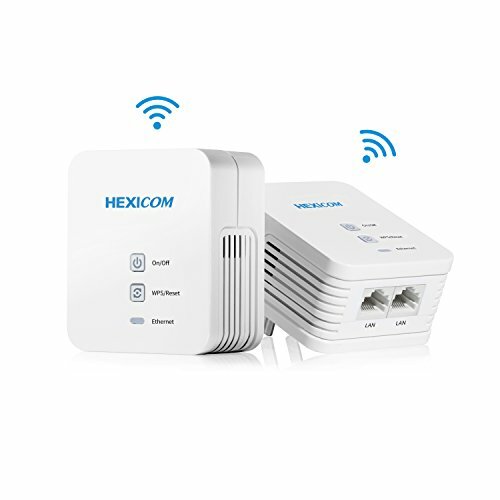 →HEXICOM powerline adapter has the same function to a router, it has dynamic IP ( DHCP ) and static IP and PPPOE dial function. you can use the master to extender ethernet after router.Maximum 7 extender unit. If you have any questions about this product by HEXICOM, contact us by completing and submitting the form below. If you are looking for a specif part number, please include it with your message.